Breathing is something most of us take for granted. I know I did. But when your lungs do not provide the air you need, your body becomes paralyzed and you cannot move. 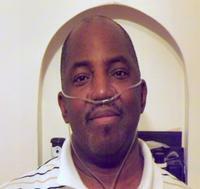 Since I was diagnosed with pulmonary sarcoidosis 18 years ago, I have been slowly losing lung function. The disease has caused scar tissue in my lungs and they have become stiff and unable to hold much air. Because of this, my lungs have lost their ability to move oxygen into my bloodstream at a normal rate. As a result, my heart has been affected and I was diagnosed with congestive heart failure. Three years ago I had surgery to have a defibrillator/pacemaker implanted to regulate my heartbeats, and help control life-threatening arrhythmias (irregular heartbeats) through electric shock. As the disease has progressed over the last two years, I have had great difficulty with breathing, even with the assistance of oxygen. Getting dressed or walking from room to room has become almost impossible at times. My doctors have told me that my only real chance at a healthy life is to have a lung/heart transplant. Even with insurance, I will have many uninsured transplant-related expenses such as: co-pays and deductibles, a medical flight, temporary relocation to be near the transplant center for an extended period of time and the costly immunosuppressant medications that I will need to take for the rest of my life. This is a financial situation I cannot meet alone, and therefore, the Cleveland Clinic has recommended fundraising. To help with this financial burden, a fundraising campaign in my honor has been established with HelpHOPELive, a nonprofit organization that has been assisting the transplant community for 30 years. All donations are tax-deductible, are held by HelpHOPELive in the Great Lakes Lung/Heart Transplant Fund, and are administered by HelpHOPELive for transplant-related expenses only. Your contribution is greatly appreciated.Your financial gifts will be greatly appreciated and will help me make it through this difficult time. Praying for healing and that your spirits will be uyplifted from our contributions. We love you and are praying for you everyday. GOD BLESS YOU AND PLEASE BE STRONG. You are always in my prayers. Love you always. We are praying for your transplants and a normal productive life. Stay strong because you have so much to live for and so much more to accomplish. No doubt in my mind, God is not finish with you. Your like a little brother, if there is anything you need, please do not hesitate to call.